I’ve always been a little funny about zoos. I completely understand their pros, but for me it just doesn’t feel right ogling at some of nature’s most beautiful creatures when they’re trapped in tiny cages. 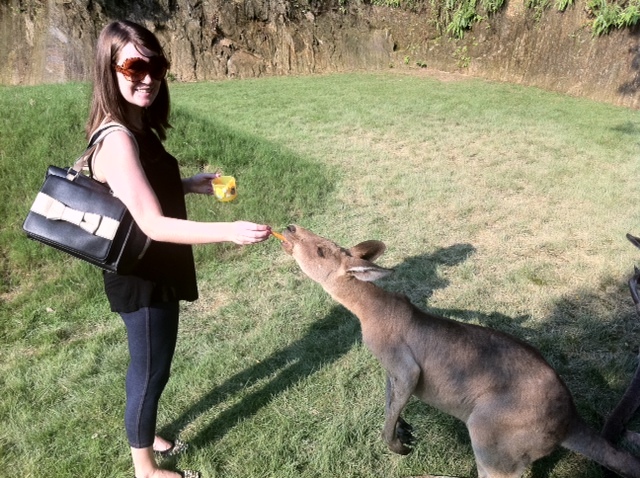 For this reason, I haven’t been to a zoo since I was old enough to make my own decisions. 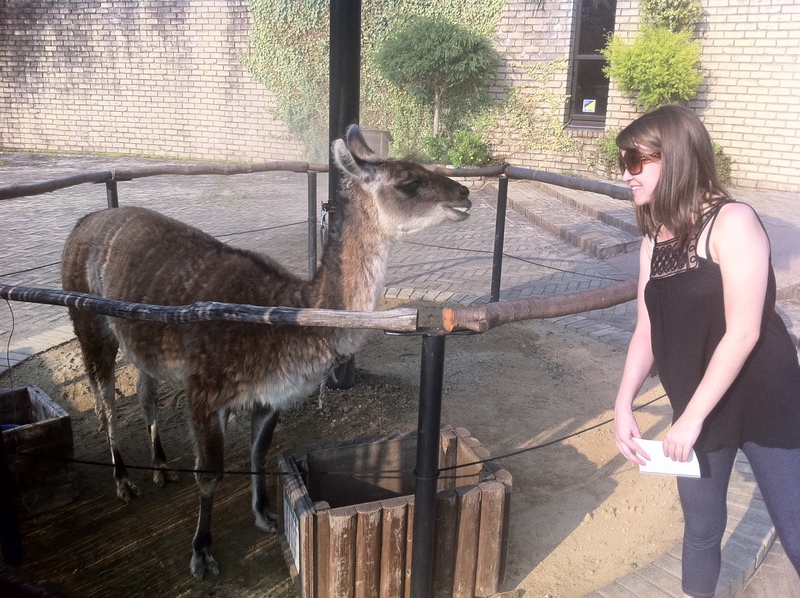 So how I ended up visiting Nagasaki Biopark, I don’t really know. We were passing by on our summer road trip to Kyushu last summer and out of curiosity, decided to give it a closer look. The park is essentially a petting zoo but like no other I’ve ever experienced before. My image of a petting zoo is a park with some sheep, pot-bellied pigs and other farmyard animals. My last memory of such a park involved sticking carrots through a wire mesh fence in the hope of attracting a couple of billy goats. My fervent attempts were unsuccessful and the closest I got to any animals was when I was I was briefly chased by a flock of excitable chickens. 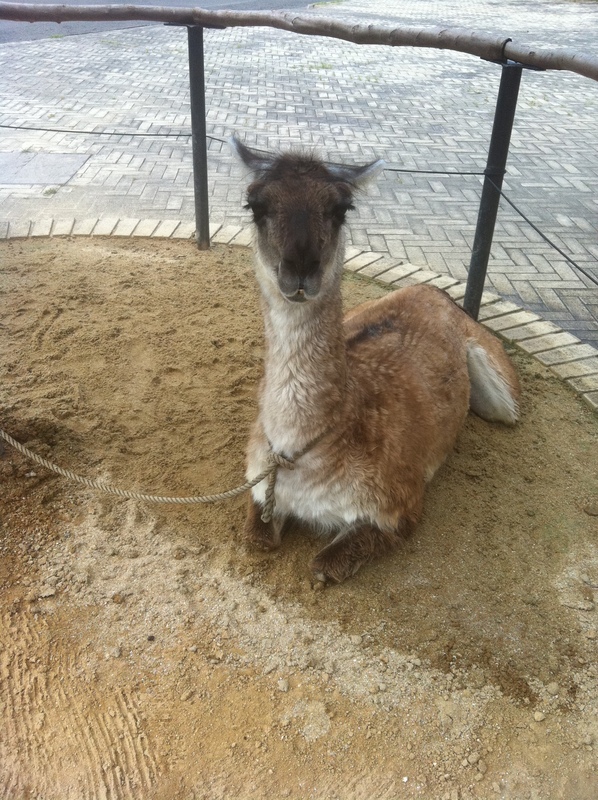 When we arrived, we were greeted by an alpaca in a tiny circular paddock. I felt a little sorry for her and instantly began to doubt if we should venture into the actual park. It was the height of Japanese summer but thankfully little alpaca was being cooled with a comforting misty sprinkler as she chomped on some vegetables. After some pondering we decided that we’d pay the 1,600 yen entrance fee and head inside. Looking at the visitors map it was clear that this was one huge park, stretching over 300-thousand square meters. Everything from stag beetles to hippopotamus are housed here. 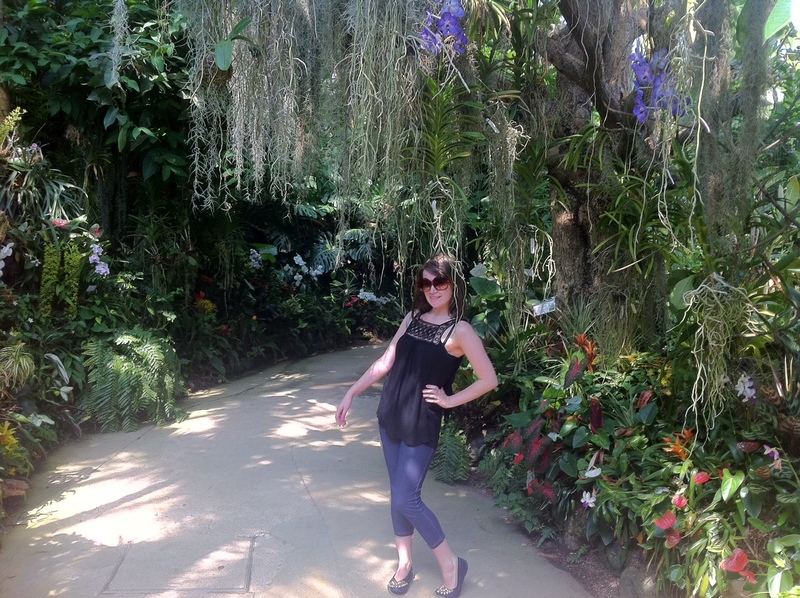 There’s even a flower dome and butterfly garden. While none of the animals are entirely free – they’re still enclosed within the park – it was far from the caged environment of a traditional zoo. In fact, I didn’t see a single cage in sight. The park can best be described as a play park; for animals. They’re in their element climbing trees, exploring their own little habitats and interacting with fellow lodgers. Some of the more courageous monkeys were also keen to make some human acquaintances and I was very surprised when a friendly black monkey decided to perch on my shoulder. The concept of the park is to make us feel on the same level as each of the animals as we walk through their habitat and see them going about their daily rituals. I have never before experienced a park that gives visitors such a hands on experience with the animals. And I was so surprised at how close I got to so many exotic creatures. 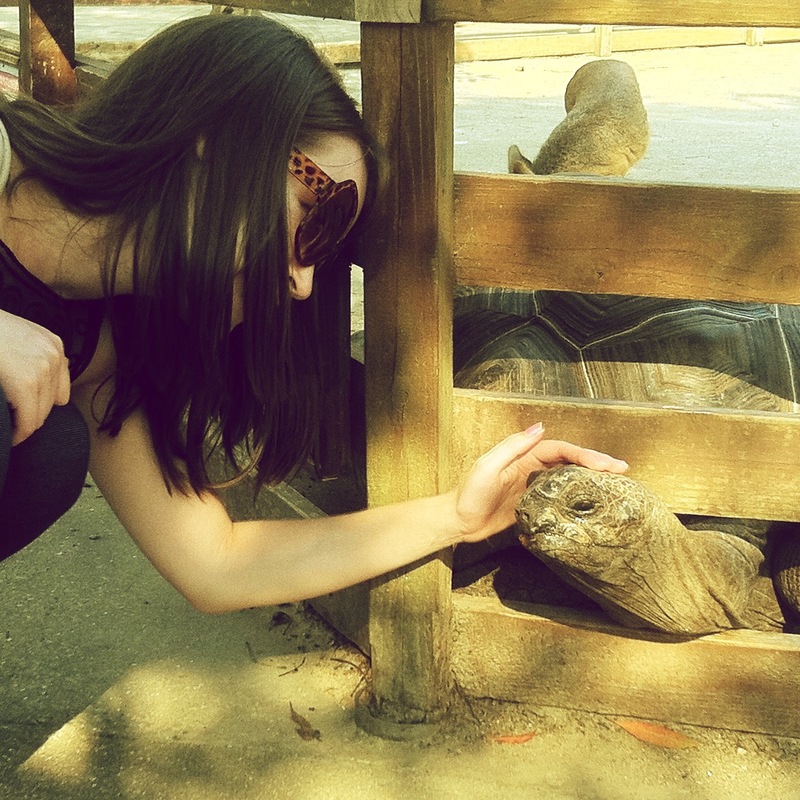 This friendly tortoise was looking for someone to scratch his head – I was only happy to oblige. Too cute! Around the park there are machines where you can buy small amounts of feed for various different animals found around the park and I fed everything from spider monkeys to pelicans. 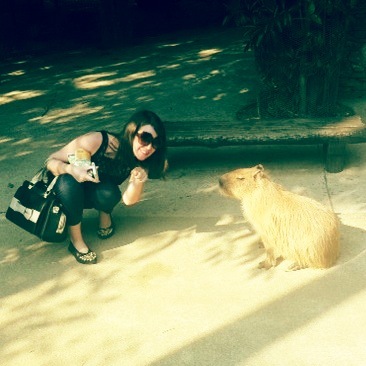 No matter what I did, I couldn’t persuade this disinterested capybara to look at the camera. 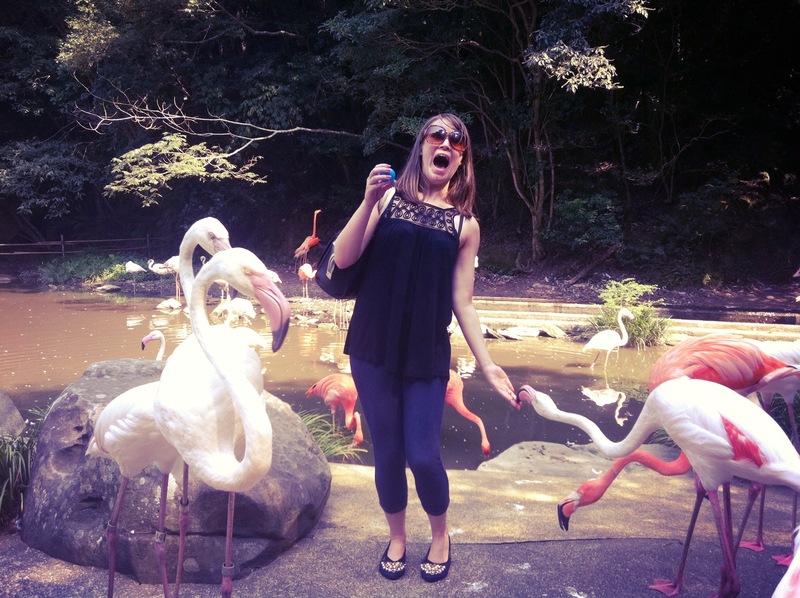 Out of all the animals, I was most excited about meeting the flamingos. They’re such odd looking creatures and it’s a huge mystery to me how their little stick legs can prop up their plump bodies and exceedingly long necks. Plus they’re pink and definitely one of the more glamorous critters around. Up close they’re a little more threatening than I imagined and I was terrified when I held out my hand to feed what seemed to be the alpha male of the group. Their beaks are really sharp and could definitely do a lot of damage if they wanted to but thankfully I only felt a light tickle as he gracefully nibbled the snacks on my outstretched hand. It was a little scary – can you tell? Not everyone was as forward – some needed a little coaxing. In addition to the roaming exotic animals, there was also a little “pethouse” housing pot-bellied pigs, ducks, billy goats, rabbits, various other rodents in addition to an owl and even some cats who are thankfully kept in their own section. 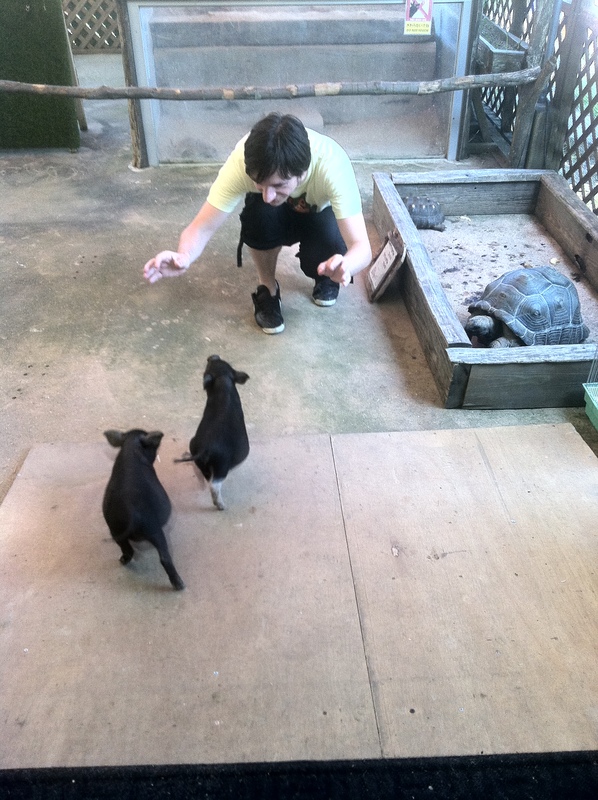 Although adorable, it was absolute chaos in here as all the animals were just running around all over the place. I couldn’t move without being trod on by an excitable duck or bumping into a pig. At one point I looked at Gavin to see him cornered between a hyperactive chicken and a billy goat who was chewing on his t-shirt. It reminded me of that manic scene at the start of Mrs Doubtfire with the birthday party gone wrong which ended with the mum coming home to find a goat eating her plants and a horse scoffing the birthday cake. 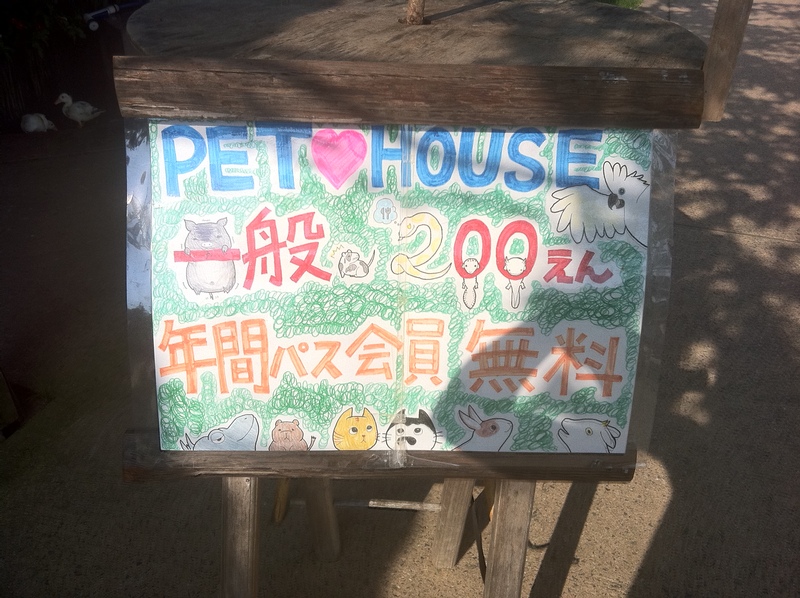 To venture into the “pethouse” it costs 200 yen extra and once inside you can buy little cups of vegetables to feed the animals. 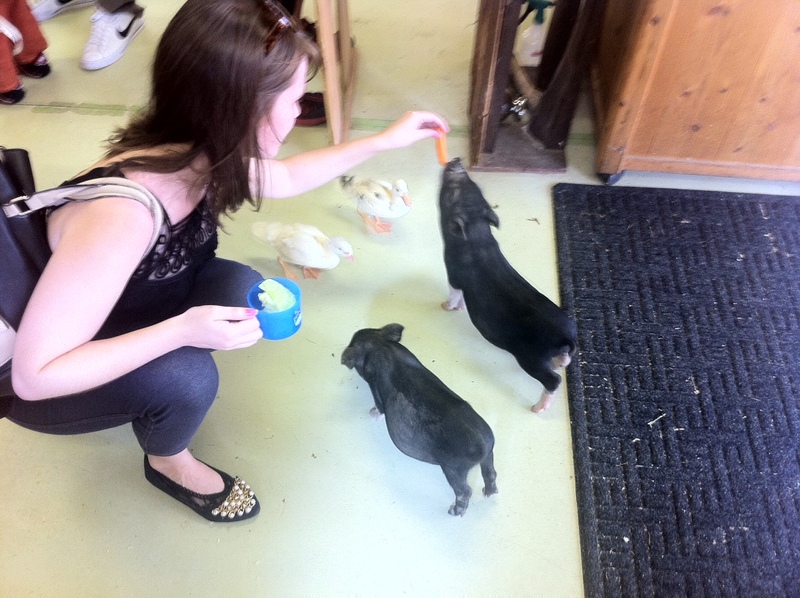 Feeding some piggies – the chicks want in on the action too. Seeing whether Gavin had any snacks. 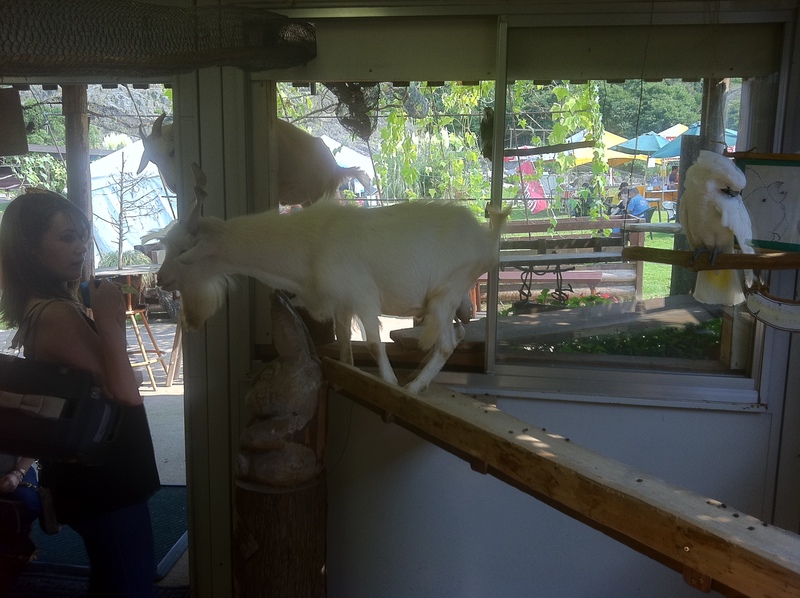 The goats were pretty full-on! Never mind the snacks – looks like I was on the menu here! 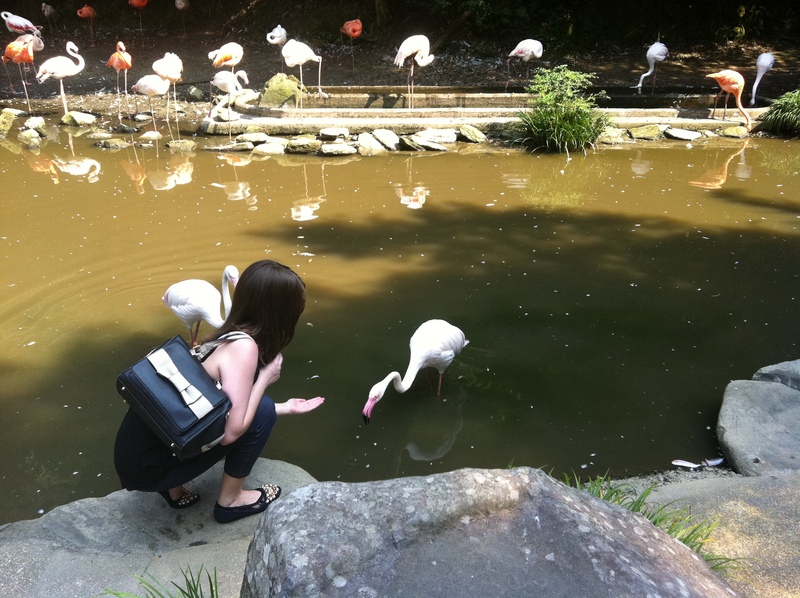 The hands on nature of the biopark really emphasises the importance of living in harmony with the world around us. It was incredible that the animals were not caged or restricted and human visitors and animals walk around freely together. Looking around it was so nice to see kids playing with full grown kangaroos, feeding monkeys and patting reluctant capibaras. What a wonderful learning experience for little ones.The biopark is certainly a very unique place and an experience that I’ll never forget. 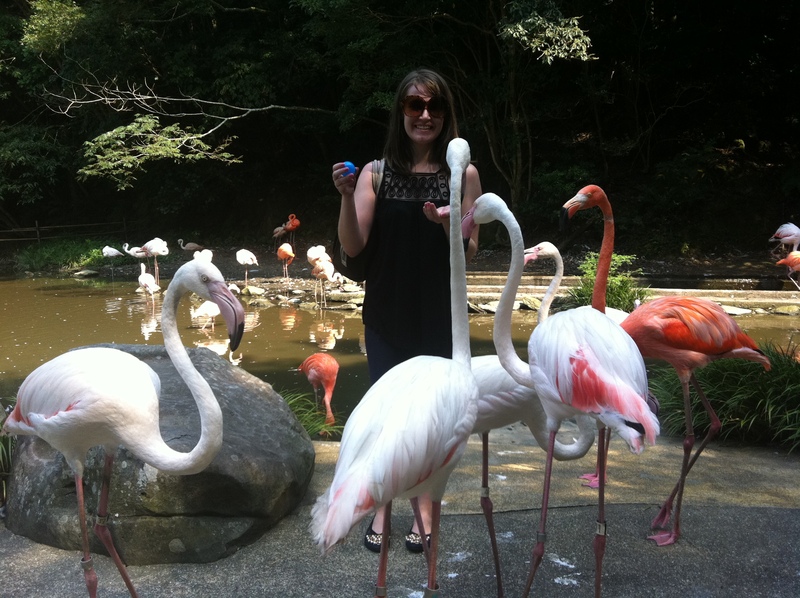 Plus, I can tick one of my lifelong ambitions off the list – fraternising with flamingos. I had time to say goodbye to an old friend on the way out.